Seven out of ten Tufts undergraduates live on campus. 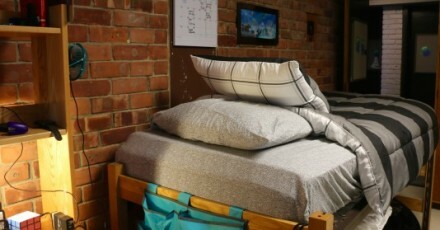 Between freshman and senior year, students can choose from 40 residences ranging from small special interest houses and traditional dorms to shared apartments. Many juniors and seniors will live off-campus as well. There are over 25 residence halls at Tufts, including eleven halls dedicated to first-year students. Students in the residence halls organize discussion and study groups bring in guest speakers, and plan all sorts of social activities together. Students in the BFA program are housed within walking distance of the SMFA at Tufts Fenway Campus, as it provides close proximity to the studio facilities and Boston’s visual arts community. Sophomores, juniors, and seniors can live in special interest group housing, which gives students a chance to live with people who share their cultural or academic interests. There are 16 small group units at Tufts - including the Chinese House, Arts Special Interest Unit, and French Language House - each offering an assortment of activities for residents. By your third or fourth year at Tufts, you may be ready to take the next step in the transition to full-fledged adulthood by making a move off campus. Medford and Davis feature free-standing homes that make for cozy and convenient temporary digs. The Off-Campus Housing Resource Center in the Office of Residential Life and Learning is a free service that assists students in finding housing and learning about the leasing process. Check out the sublet and apartment rental listings on their website to get a sense of the going rates. There are on-campus options for juniors and seniors – including the beautiful senior apartments in Sophia Gordon Hall – but on campus housing is only required and guaranteed for freshmen and sophomores. Cam Harris '18 put together this gallery of dorm rooms on campus!